Sydney Rapid Transit (SRT) could reach a new airport at Badgerys Creek, possibly via the existing Kingsford Smith airport at Mascot, as part of the Southern extension of a Second Harbour Rail Crossing. The idea was floated last week by the Transport Minister Andrew Constance when he said that “I think it is a case of putting all things on the table”, in which he also called on the Australian Government to provide funding for a rail line to Badgerys Creek. The Australian Government has committed $2.9bn in funding for roads to support the airport, but no money for rail. The proposal is currently little more than a thought bubble. But if it were to happen, what could it look like and how would it build on existing plans that are already locked in? 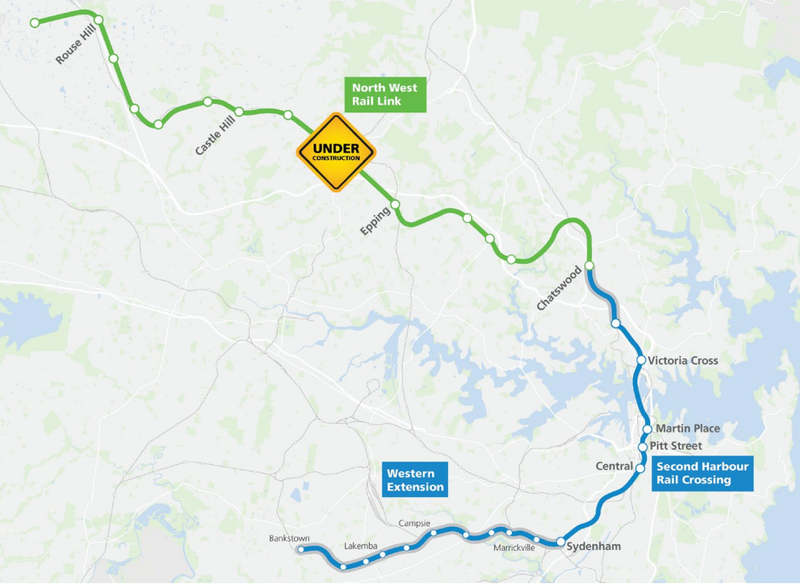 The North West Rail Link (NWRL) from Rouse Hill to Epping is currently under construction. 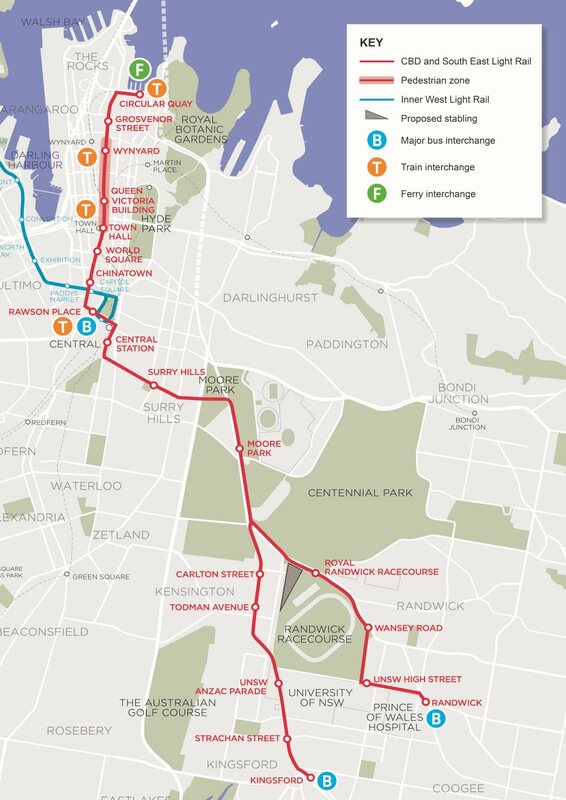 It will be connected to the Epping to Chatswood Line, set to be closed in 2018 so that it can be converted, with the new Rouse Hill to Chatswood Line opening in 2019. Construction of a Second Harbour Rail Crossing from Chatswood to Sydenham will begin in 2017, and is expected to open in 2024. This will also see the Bankstown Line converted to single deck operation between Bankstown and Sydenham, also with a 2024 opening. 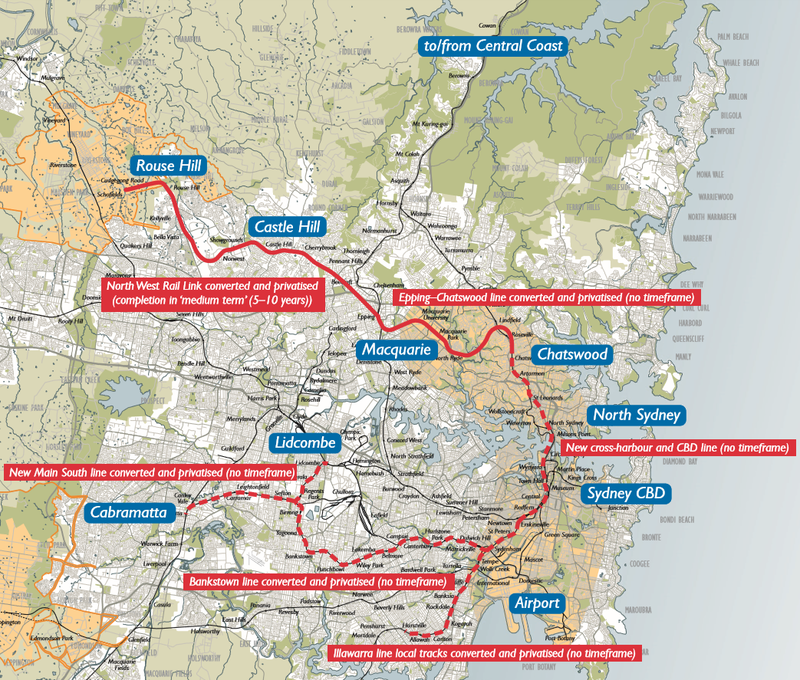 There are further plans to expand the line from Sydenham to Hurstville. Earlier plans showed the line extending from Bankstown to both Lidcombe and Cabramatta, but more recent plans show the line terminating at Bankstown and not continuing further. 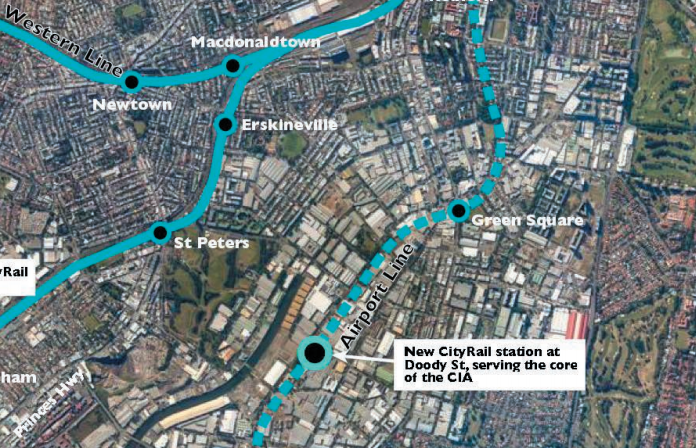 A rail line from the North West to the South West via the CBD is not a new concept. This is exactly what was proposed in 2005 as part of the Metropolitan Rail Expansion Program (MREP). This would involve the extension of the Epping to Chatswood Line via the construction of the NWRL and the extension of the then East Hills Line (now T2 Airport Line) via the construction of the South West Rail Link (SWRL). Core capacity would then be increased by building a new under the Harbour and CBD rail line, plus additional tracks from Chatswood to St Leonards; Sydenham to Erskineville; and Kingsgrove to Revesby. The difference is that the MREP proposal would use double deck trains and travel via Sydenham, therefore bypassing the existing Airport Line. 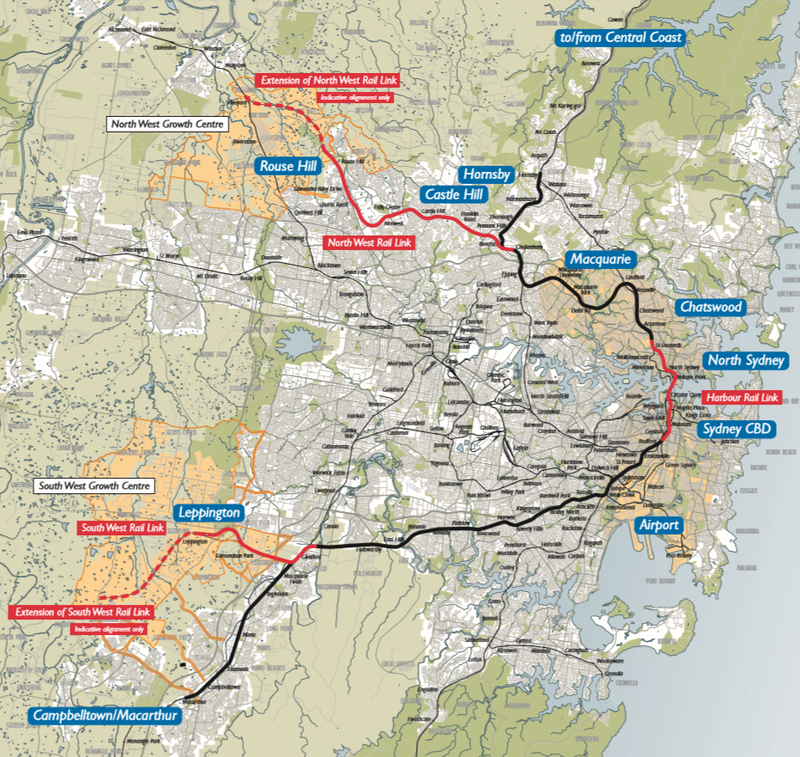 A metro line out towards Sydney’s South West was also part of a leaked 2012 report, which suggested extending SRT from Wolli Creek to Revesby. 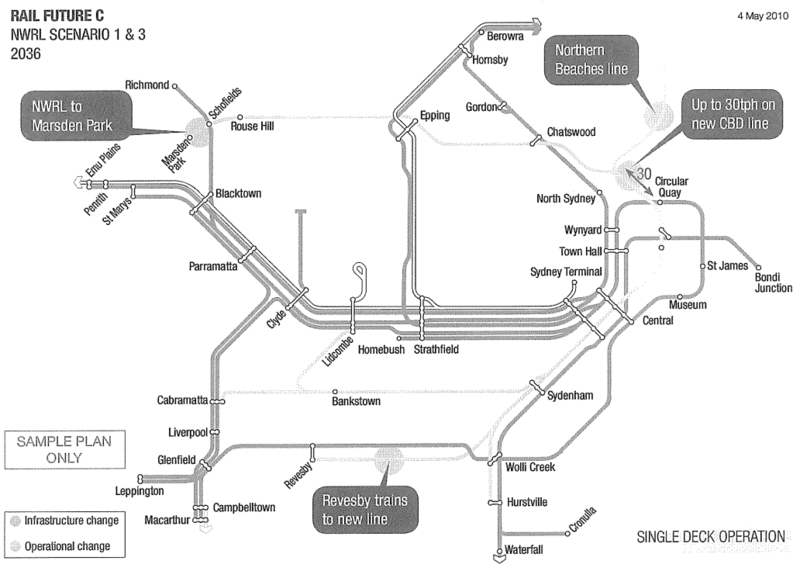 This would follow the initial conversion of the T3 Bankstown Line and then later also a portion of the T4 Illawarra through to Hurstville to the new SRT system. The latter of these two conversions passes through Wolli Creek, which would allow the portion of the T2 Airport Line to also be converted. SRT could then provide all station services on these lines, with the remaining T2 and T4 trains running express from the outer suburbs. However, this proposal would not actually reach either airport. If both airports are to be connected then the entire T2 Airport Line would need to be converted to SRT between Glenfield and Central. The resultant shift of patronage from the T2 Airport Line to SRT together with the ability for SRT to reach the T2 Airport Line directly from Central without having to travel between Wolli Creek and Sydenham, eliminates the need to convert the T4 Illawarra Line to SRT. In fact, it would make more sense to maintain all station services from Hurstville within the Sydney Trains network and instead send them into the City Circle, joining the remaining T2 Airport Line trains (which would likely revert to the previous East Hills Line name, given they would no longer travel via the airport). This lifts the current capacity constraint on the T4 Illawarra Line, which along with the T1 Western Line is Sydney’s most congested. The T2 Airport Line currently has 4 tracks between Wolli Creek through to Revesby in the West, where it drops down to 2 tracks. The line West of Revesby would need to be quadruplicated out to Glenfield, providing 2 tracks for T2 trains and 2 tracks for SRT trains. The Northern end of Glenfield Junction may also require some upgrading to prevent any conflicting moves between T2 and SRT trains, however the Southern end is flexible enough to be able to handle the merger of Sydney Trains and SRT services. From there it is simply a matter of converting the existing SWRL to SRT, while also extending the line out to Badgerys Creek or further. Journeys from the SWRL would be limited to all stop services on SRT, which would probably take around 60 minutes from Badgerys Creek to Central (perhaps 45 minutes if SRT allowed for shorter dwell times and faster acceleration). Passengers could change at Glenfield with a simple cross platform transfer to a faster express train directly to Central (or elsewhere). Meanwhile, the shutdown of the T2 Airport Line for SRT conversion could also be used as an opportunity to add an additional station (Doody St) between Mascot and Green Square and/or an additional station (Waterloo) between Green Square and Central. 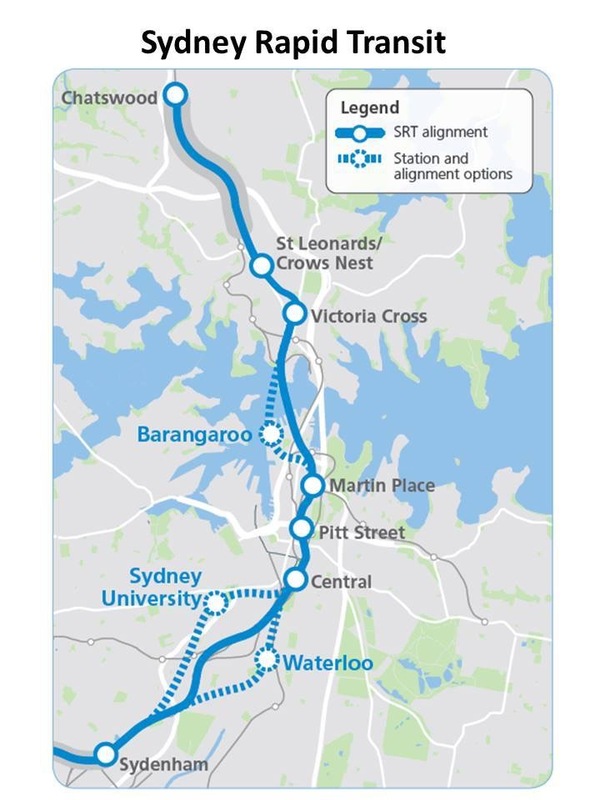 This would allow the Central to Sydenham alignment of SRT to take the Northern approach, via Sydney University; rather than the alternative proposal via Waterloo. The 10km portion of the T2 Airport Line between Wolli Creek and Central is currently privately owned, but reverts to public ownership in 2030. Conversion would probably have to occur after 2030. However, with the initial Rouse Hill to Bankstown portion of SRT set to open in 2024 and an airport at Badgerys Creek set to open in 2026, the timing is not too far off the mark. Rail services would not be running on the day the airport opens, but they could commence a few years afterwards. This is problematic if the aim is rail on day one, but ideal timing if the aim is for a gradual increase in transport connections as airport usage ramps up over time. Note: Life has been busy for the last 2 months and I have not had a chance to put up any new posts. I am still alive, and after a much needed break it’s time to return. The old weekly updates will probably be replaced with monthly updates supplemented with more posts on specific topics. The aim is for 2-4 posts per month all up. The former Transport Minister and Deputy Liberal Party Leader, Gladys Berejiklian, received a promotion to Treasurer and will be replaced by Andrew Constance who will hold the new title of Transport and Infrastructure Minister. Duncan Gay remains Roads Minister and John Ajaka is the Parliamentary Secretary for Transport and Roads. The Shadow Transport Minister, Penny Sharpe, may be reappointed to the Legislative Council seat that she recently resigned in order to contest the Legislative Assembly seat of Newtown. Ms Sharpe lost her bid to enter the Legislative Assembly and after this loss had initially planned to leave politics. Over coming weeks, geotechnical drilling will occur up to 70 metres below Sydney Harbour to help determine the best location for the new Sydney Rapid Transit railway tunnels. About 30 boreholes will be drilled as part of the Sydney Rapid Transit geotechnical program, with roughly half of them beneath Sydney Harbour and the rest on land either side along the route at Sydenham, in the Sydney CBD, North Sydney, Crows Nest, and Artarmon. Construction is currently planned to begin in 2017, with a 2024 opening date. Plans for the layout of a future Badgerys Creek Airport, provided to the Australian Government in February and obtained by the Daily Telegraph, show an airport rail line will run parallel to and in between the eventual 2 runways (shown as a green dashed line in the image below). The rail line is currently planned as an extension of the recently opened South West Rail Link, with a potential further extension North to the Western Line. Heavy rains in Sydney caused significant disruptions to the rail network, including the temporary closure of some train stations due to flooding.